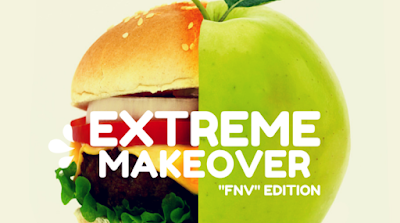 If you're not aware, there was a recent announcement of a new program entitled FNV, the aim of which is to aggressively market fruits and vegetables to kids. The pros and cons of this idea were recently virtually debated by Casey Hinds (she's not a fan) and Bettina Seigel (she is a fan). I think both make great arguments, though I side with Casey, I think it's a bad idea. And while I agree with all of Casey's argument, especially her concerns around juice, I want to add another to the mix. Seeing photos of food, any food, causes the release of ghrelin, one of our bodies' primary hunger hormones. In turn this may help to explain the findings of one study that looked at advergames and children and how even when the advergames promoted fresh fruits and vegetables, the outcome for the kids playing them was an overall energy intake increase - not exactly a great plan for a country struggling with childhood obesity. While I'm all for children consuming more fresh fruits and vegetables, especially in the place of junk and fast food, I just can't wrap my head around the notion that adding more food advertising to our kids' lives is going to help. I think kids (and adults frankly), would be far better off if they weren't being continually being told to eat and shown photographs of luscious foods (healthy or otherwise) given these advertisements may well be physiologically priming them for larger portions, and regardless of what's being advertised, indulgent cravings. And out of curiosity, is anyone aware of any data on the availability of fresh fruits and vegetables for the average kid in America? Does the average household have fresh fruits and vegetables at all times? Are they readily available in schools and arenas? All that said, fingers crossed the program has wonderful outcomes, and that my concerns lack merit.